I was in Reno with my family for the Far Western Regionals volleyball tournament that my wife and daughter were participating in. There was far too much teenage estrogen packed into the convention center for my liking along with the accompanying support parents, many of whom I can best describe as overly zealous. Like me, not all of the parents were there enthusiastically, but few of these had the flexibility to "disappear" during much of the tournament to gamble, shop, or in my case, go hiking. So that I might get back to the convention center to see the last match of the day, I planned for an easy outing to Tule Peak. With more than 3,400ft of prominence, Tule Peak is the highpoint of the Virginia Mountains, a small range about an hour north of Reno/Sparks, on the western side of Pyramid Lake. The hike is about 5 miles one way, plus around 3,500ft of gain. From SR445, I took the Winnemucca Ranch Road for 12 miles, changing from pavement to excellent dirt along the way. I did not attempt to drive up the side road on the right that shortens the hike by more than a mile - high clearance is advised here. I simply parked at the junction and started off around 7:30a. Tule Peak is clearly seen from the start, and indeed for most of the hike. There are any number of ridges or ravines that could be equally employed to gain access to the summit. I followed the old road towards the mountain even as it began to veer to the left, somewhat away from the most direct route. At a junction and fenceline I turned right to follow a fork following the fence for about a quarter mile to where the fence jogs left. Signs seem to indicate at least some of the lands are private property. I found two more fences traversing across the base of the mountain that I climbed over. I imagine this put me into private property, but there were no cattle, no buildings, no people and little risk of this being a problem. Cross-country travel in the Virginia Range is fairly easy, as in many of the Great Basin ranges that are more desert than anything. There was ample evidence of past fires having swept through the area and it appears the brush doesn't grow very tall or thick. A number of rabbits and birds were spooked from their hiding places as I approached, but the only other animals I found were a few lizards and a solitary deer (there is ample evidence of wild horse, however). The Winnemucca Valley, now below me, is long and wide, lying between the Virginia Mountains in front and Dogskin Mountain behind me. Because Tule Peak is some 1,300ft higher than Dogskin Mountain, one soon climbs higher than Dogskin and is treated to the snow-capped peaks of the Sierra Nevada behind it, notably the Mt. Rose area. By 9:50a I had topped out on the south-facing ridge I had been climbing, greeted by a white pole in a cairn at the edge of the small summit plateau. Another five minutes of hiking found me to the highpoint marked by a larger cairn with a smaller white stick. The summit view to the east is dominated by Pyramid Lake, with Tohakum Peak to the northeast and Virginia Peak/Pah Rah Mtn to the southeast. To the south and west rise the Sierra Nevada, with Mt. Rose, Mt. Lola, and Sierra Buttes easily visible. It is said that Mt. Lassen can be seen on a clear day to the northwest, but it was not clear enough today for this view. A MacLeod/Lilley register was found in a glass jar dating to 1996. A surprisingly popular peak, there were 45 pages filled in the notebook over the years. Andy Martin, Bob Sumner and Sue & Vic Henney were among the more recent visitors. There were scraps from an older pad of paper dating to 1986, but most of the pages and entries were worn and mostly unreadable. I made a slight variation on the descent, taking a ridge/slope further east than the ascent one. 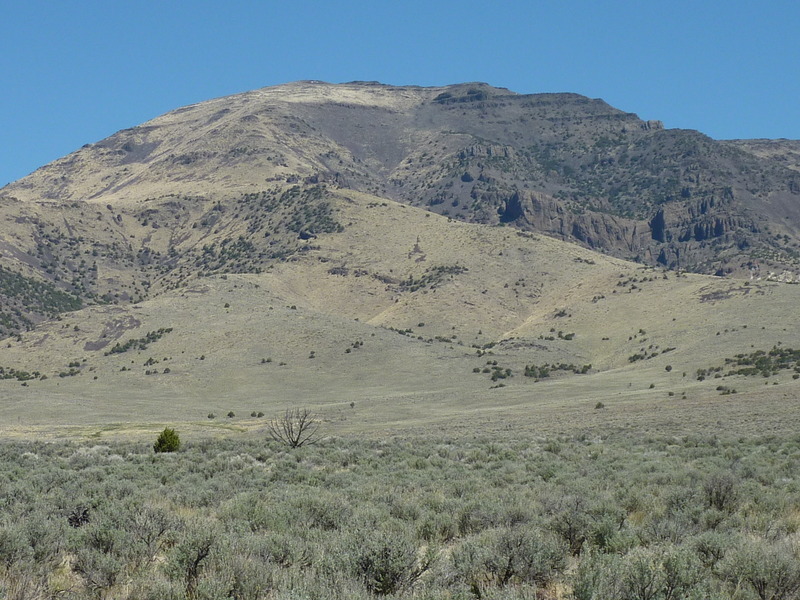 It seemed to have a bit less of the volcanic rock that is distributed somewhat unevenly over the whole range (if fact most of the ranges in this area are volcanic in origin). Though further east, I did not avoid crossing the two fences again, much as I had done earlier. Some large bones and a cattle skull were reminders that grazing took place at one time on this marginal land, possibly still does. I further shortened the return by cutting across the diagonal where the two roads make a right angle and was back to the dirt road by 11:30a and to the van ten minutes later. In all I spent just over four hours on the hike, a short day but a good workout with significant elevation gain. I managed to get back to the Reno/Sparks Convention Center before 1p, in time to watch the last match of the day - good timing, that.